Shepherd has drawn from the writings of George Orwell to bring to you the newest MajorCommand Game Map, 1984. 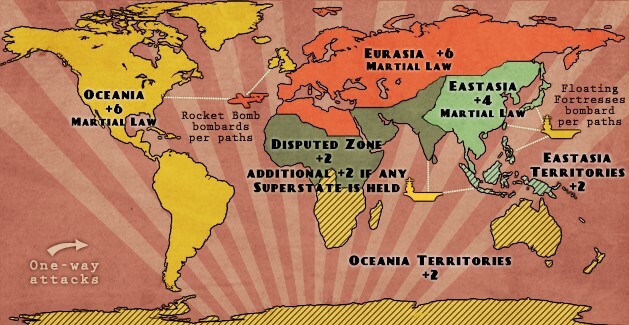 This newest RISK Game Map stays true to Orwell’s 1984 vision of a dystopian world, keeping elements like Eurasia, Oceania, and the Floating Fortresses, as part of the game play. 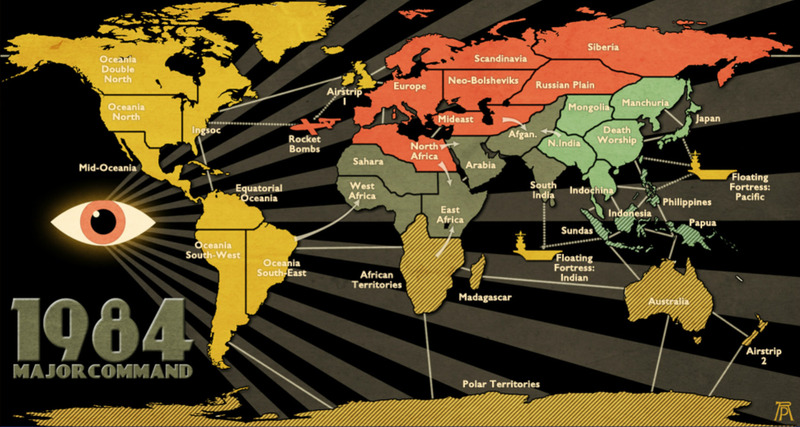 One-way attacks, Superstates, and Martial Law Territories, all have roles in this 1984 game map. Orwell’s 1984 is an advanced Risk game map, so some elements of game play may not be obvious at first, even to the experienced player. Hopefully this 1984 Risk Game Guide will help you get started. The Superstates are all under Martial Law. Which means that if you leave only 1 troop located anywhere in the Superstates, it will revert to neutral at the beginning of your turn and you will lose that troop. You MUST leave a minimum of 2 troops on any region in the Superstates if you want them to survive. Pro tip: If you leave 2 or more troops on a region in the Superstates, and another player knocks you down to 1 troop before your turn starts, you WILL lose that troop at the beginning of your turn when it reverts back to neutral, so Beware! NOTE: The two Territories and the Disputed Zone are not subject to Martial Law, so leaving 1 troop is safe. It will not revert to neutral. Though, of course, it still may be attacked by another player. Holding any one of the Territory Commands will give you a 2 troop bonus on your next turn. Holding the Disputed Zone Command will give you a 2 troop bonus on your next turn. AND you get an additional +2 for every Superstate you hold in its entirety along with the Disputed Zone. The are two (2) Floating Fortresses, and one (1) Rocket Bomb. If you control the Oceania Superstate for a full round, then you will be given control both Floating Fortresses at the start of your next turn. NOTE: The Oceania Superstate is different then the Oceania territory. Each Floating Fortress is worth 6 Troops that you can use to bomb the regions connected by the lines on the map. If you control the Eurasia Superstate for a full round, then you will be given control of the Rocket Bomb at the start of your next turn. NOTE: The Eurasia Superstate is different then the Eurasia territory. The Rocket Bomb is worth 12 Troops that you can use to bomb the regions connected by the lines on the map. We will be rolling out this map in stages, giving paying members the opportunity to test the game for bugs before it is released to the public. August 15 2017 – Commander Class can create games, anyone can join. August 22 2017 – Strategist Class can create games, anyone can join. August 29 2017 – Open to the public. There are also several one-way paths of attack on the map, so be aware of those before planning your strategy. So after posting an update last week, we have even more (and better) news to update you with. As you can gather by reading the title, we have cut the loading times of Classic Massive and Europe Massive by 70%! Previously, on a good day, Classic Massive would take 50 or 60 seconds to load if you were lucky, and sometimes not at all. Well those days are gone. We have brought that loading time down to 16 seconds. That’s a 70% improvement. After the database and game archiving Marcos did last week, we noticed an odd anomaly. Classic Massive and Europe Massive showed no signs of improvement at all. All the other maps loaded in around 6 seconds, but those two maps still took a full minute to load. So we did some digging in to what made those two maps different from the rest. Because the issue rests with how Adobe Flash handles the data, there was no way to analyse what was happening in the Flash code in your browser, so we started looking at some external variables. We always assumed that Classic Massive and Europe Massive were slow to load because they has the most regions and territories, but a comparison of the maps showed that 12 Domains was almost the same size and has almost the exact same number of regions. However, 12 Domains took only takes 6 seconds to load, while CM and Em took 50 seconds. Obviously there was something we were missing, something other than size and regions…. Long story short, we figured out what Adobe Flash was having problems with and we immediately worked on fixing the issue. An unfortunate result is that you will have less Troop Colors to choose from, but the good news is, those Maps now load faster then they ever did! Last week, some players depending on your physical geographical location, may have experienced missing data under their Intel tab when once the map loaded. This was caused by our CDN (Content Delivery Network). We use CloudFlare which have servers located around the world to help deliver our images and data to you quicker. For some reason, which was never explained to us by CloudFlare, some of their servers, but not all of them, caused this error to happen with our game. It only affected some players but not others, which is what made it so odd to figure out. Somehow Marcos connected the issue with CloudFlare which made it easier to solve. Turns out that a setting on their control panel that we have been using for 4 years, suddenly started causing problem. Once we narrowed it down we simple turn off that setting and everything is back to normal. Back in the 90’s someone once told me that a person can make a mistake, but it takes a computer to really f things up. Nonetheless, Marcos is going away on a well deserved break for a week, but he is leaving us with a working and fast site. I just hope nothing unexpected happens in the next 7 days! Have fun and Enjoy the games! P.S. It’s also my birthday. 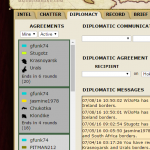 What’s New With Playing RISK Online? It’s been a few months since we posted an update, but that doesn’t mean we haven’t been busy. In fact, it’s been a very productive few months. So let me break it down for you. As you know we’ve been developing a new game engine that is more flexible and more responsive. It is now in the BETA testing stage, and is currently being tested by our Game Testing Clan. There have been some issues in the last few days regarding Map Loading times. And yes, honestly we have let the current game engine slip since it is no longer being actively updated, and we are putting all our efforts in to making the new game engine functional. However, obviously being able to play a game of RISK online properly is vitally important. So we pulled our attention away from the new engine for a couple days to address the current problems. * We have plans to archive another 20%-30% of files, bring the total size of the Database to less than 50% of what it was yesterday. * We also set the archiving script to run daily, so the buildup and bloating of the DB won’t happen again. Remember though, the old game engine is still the old game engine so it will inherently be slow and cumbersome, but we have done all we can to make it as functional as possible with what we have. The real improvement will only be noticed once we adapt the new engine. Currently smaller maps should load without issue, but larger 24p/Massive maps may still take up to a minute. Our Map maker Shepherd has been busy creating a new RISK game map. If you haven’t heard about it yet, then you can catch up in our NEW RISK MAPS thread in the forums. It is obviously a very cool looking map, and it is quite complex, even for experienced players. So again we have our team of RISK Game Testers working overtime to try and make it perfect! As you may know, MajorCommand has been struggling financially. After a long debate, it has been determined that our best chance to stay financially viable is to do a major overhaul to our website and all our games. We will be trying to appeal to a more lucrative audience. Over the next few months, we will slowly be fading out our “RISK” style conquest games. And as a replacement, we will be targeting the highly sought after 8-14 yr old female tween demographic. We will be introducing popular gaming titles such as ‘Pretty Pony Day Care’ and ‘Baby Barbie Makeover’. We are aiming to launch our new website at the start of the new school year in September 2017. So you will still be able to enjoy the current RISK games we offer until the end of summer. Thanks for your understanding. Now that we can update the website without going offline, we’ve decided to compile a list of game updates so you can follow the progress. Keep checking back because this page will be constantly updated! PROBLEMS? 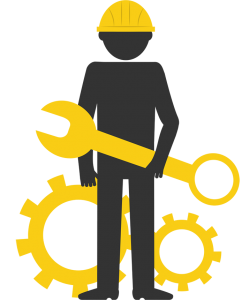 As always, if you experience any problems after an update, please REPORT THE PROBLEM IN THE FORUM! – We are now implementing another new game feature to help with all those Diplomatic Agreements! This feature was written by one of our players, gfunk74. 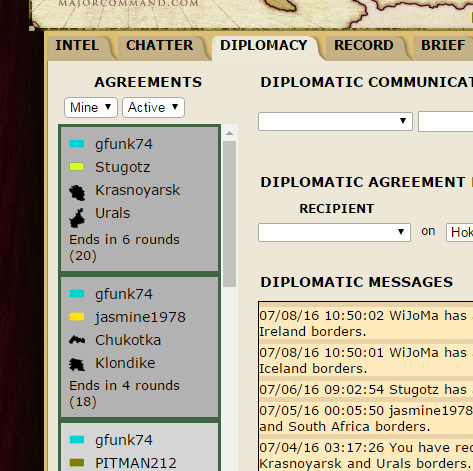 Now you can filter Diplomatic Agreements to see which agreements are still active, and filter to see only which agreements are just yours. A great idea. Thanks gfunk74! And there is an Expanded View when you click on it. – We’ve got a great new feature to help with Team Games. Now you can see if it is your Teammate’s Turn straight from your Active Games Tab! – And to double up with buttons, you can now also see if you have gone AWOL in a game for some reason. – Fixed the “Disappearing” Displayed Medals Issue. When a player receives a new medal, it replaces a displayed medal on their Profile page. However, the replaced medal does not show up in the background until the players actively deselects it from their medal selection box. This will fix that issue, however, in order to do so, every player will have their displayed medals reset to the default display. This will only happen ONCE when the fix is installed today. Afterwards, all players can choose their favorite medals again to be displayed without issue from the setting page. 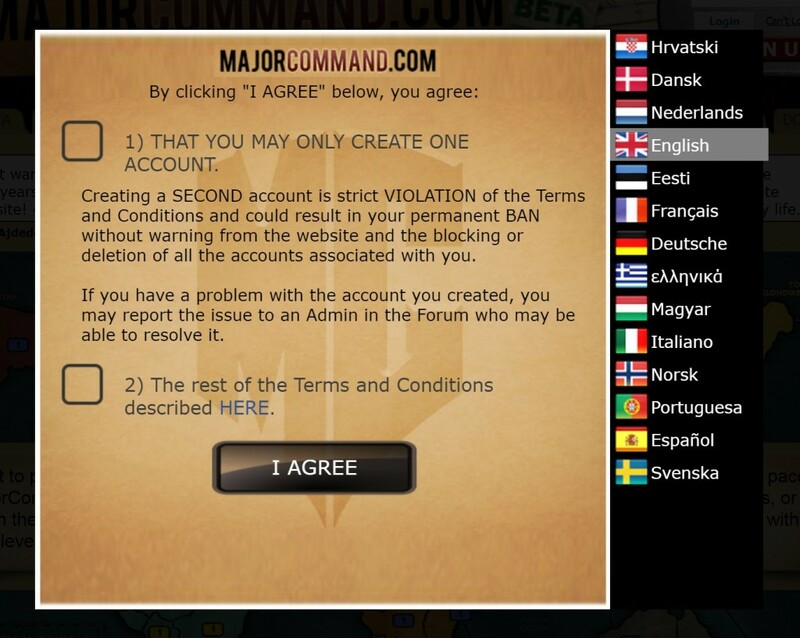 – With the help of players in the Forum, We have created a 14 language Popup Agreement for Users who are creating a new account. Or for players who are creating a SECOND account! – And a few minor fixes and more improvements to the new game engine. – 14 different bug fixes and improvements to the website that include better email verification and protection from spam users. – We have made major steps forward with out new game engine and are nearly ready for Beta testing. – We have a New Stats Page! – The Medals Displayed on your Profile Page are now grouped together. – The Medals Display Box in the Setting Page is now sorted alphabetically. – The Most Decorated section on the Scoreboard now contains a row with the actual Medal count. New Mobile Responsive RISK Game Blog! CryptoJim on New Mobile Responsive RISK Game Blog! NewSheriffInTown on New Mobile Responsive RISK Game Blog! luiscasanova on New Mobile Responsive RISK Game Blog!